A prior obedience class, such as Focus Foundation, is strongly suggested and encouraged. For participation in Contacts & Weaves (Level 1B) you must have graduated from Core Skills (Level 1A), or your dog must have good trained jumping skills and you need to have acquired an understanding of agility handling skills from another source or class. To play agility properly, it is very helpful if your dog can sit, lie down, stay, and come around the distraction of other dogs. 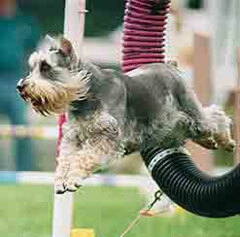 Agility is a fast-paced, super-fun game you play with your dog! In this sport, the handler has a limited amount of time to get their dog to safely navigate a set of obstacles in a predetermined order. The obstacles can include jumps, tunnels, weave poles, A-frame, dogwalk, teeter-totter, and more! 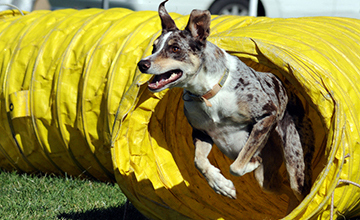 The dog must safely complete the obstacles in a specific order and within the time limit. In Introduction to Agility: Core Skills dogs will be introduced to many of the obstacles in agility such as jumps and tunnels, in a safe and controlled manner to build your dog’s confidence and skills. Owners will be taught handling skills and footwork to best communicate with their dog teammate. In Introduction to Agility: Contacts and Weaves, the dog will learn how to negotiate the contact equipment with confidence (dog-walk, A-frame, teeter). The correct end position for the contact equipment will be introduced and shaped. Beginning success in the weave poles, one of the most challenging agility obstacles, will be an important aspect of the class. The skills needed to successfully negotiate the obstacles and the handling skills will be worked on weekly in both classes. Attention, focus, teamwork, and motivation will be practiced as the team builds confidence in an atmosphere that centers on learning skills while having fun. By the end of these classes, the dogs will have a good working knowledge of many of the obstacles and will be building up their confidence.